In today’s face-paced “knowledge is everything” business environment, companies rely on the delivery, timeliness, accuracy – and now visualization – of data more than ever. It’s incredibly important for users of all levels to have easy access to crucial information so better, more timely business decisions are made throughout the company. RDC specializes in helping companies leverage their investment in the Information Builders technology platform. 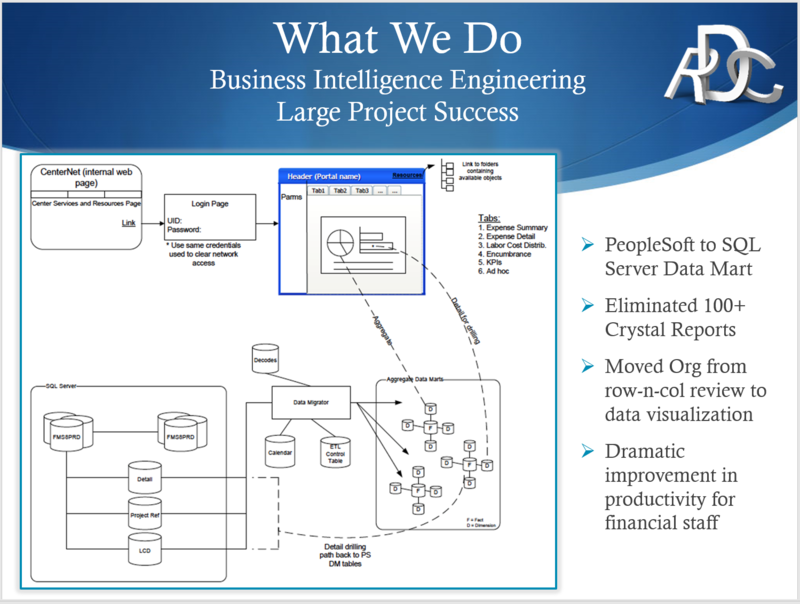 Whether you’re a long-time user or a recent adopter, put RDC’s deep experience to work to engineer business intelligence solutions that help you get the most out of WebFOCUS and the entire Information Builders product suite. 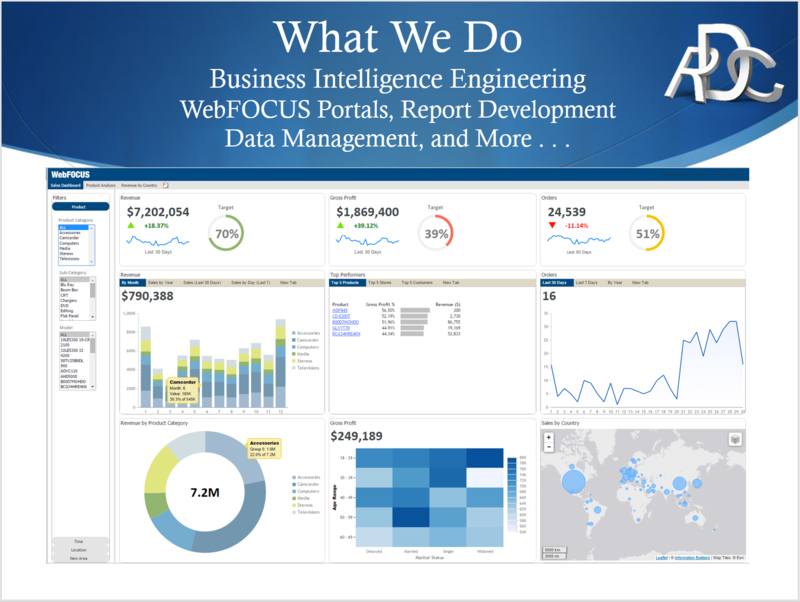 Self-service reporting, portals/dashboards, guided Ad Hoc, or full Ad Hoc & visualization . . . WebFOCUS has a solution for every user and any need. The ability to access crucial data on the go is a must today. Make sure your WebFOCUS environment delivers results from any browser or device. WebFOCUS is known for its capability to scale to the masses. Let the RDC team make sure your application is available to all users inside or outside of your firewall. Our team always ensures that not only are the governance measures enabled but that our staff takes the extra step to make sure your trusted information is protected. IBI's Integration technologies are super powerful. Leverage RDC's knowledge of the product to sync your platforms, applications, technologies, databases, and more. Use RDC to engineer your integration strategy, and together we can transform your operation to cut costs, lower risk, and improve your business’s performance. Good business intelligence relies on good data. Do you have a strategy to build and maintain an ODS, data warehouse and data marts for your BI applications? With iWay Data Quality Center users can now easily query, report, analyze, transform, load and deliver clean data to drive business intelligence. When it comes hiring your WebFOCUS development team to ensure your next WebFOCUS or iWay project is a success, why go anywhere but RDC? After all, we don’t claim to be the WebFOCUS experts for no reason. Give us a call to discuss your next business intelligence solution and experience the difference. WebFOCUS and iWay are sophisticated business intelligence and integration technologies that are used throughout a company’s enterprise and beyond. At RDC, our development, deployment, maintenance, consulting, and staffing solutions offer our clients a variety of ways to get the most out of your investment in the IBI platform while spending less out of pocket. 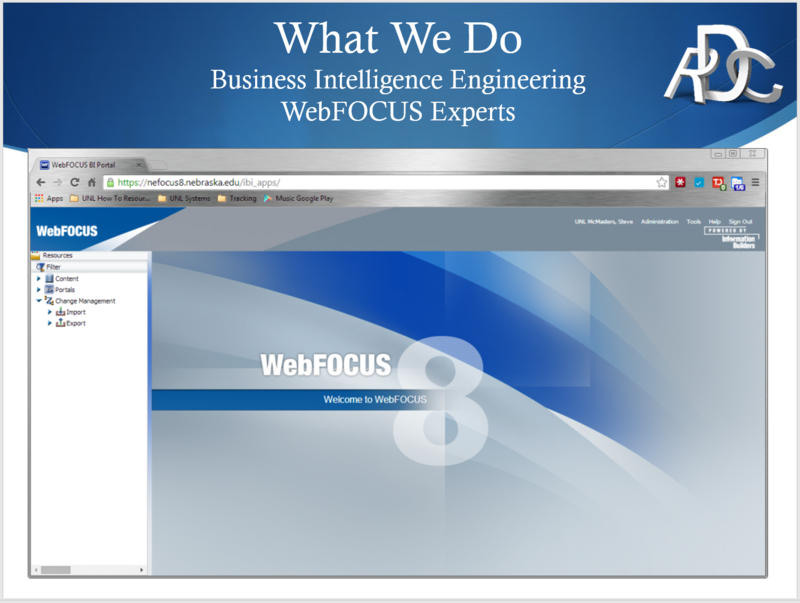 WebFOCUS is constantly evolving and over the years has become one of the markets top BI web-based applications. It’s designed for an unlimited number of users and can be tailored to every skill level. WebFOCUS now comes with flexible and intuitive development tools to help build applications more efficiently. With the ever-expanding functionality of the Information Builders tools, combined with the experience of RDC, we’re confident we can deliver maximum productivity in the development, enhancement or support of your business intelligence applications. RDC Business Solutions Promotes a “Center of Excellence”. We Specialize in the Information Builders Product Set. Upgrades and Custom Code for WebFOCUS and iWay. Data Conversion, Integration and Report Writing. Improve Decision Making, Efficiently, and Maximize Profits. 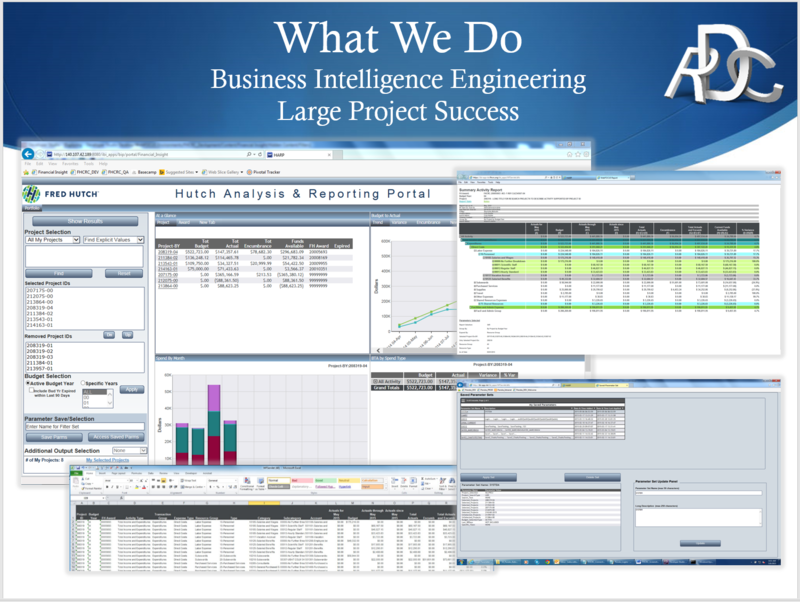 Executive Dashboards, Report Writing, and Data Quality. Bringing Data to Life Via the Web is What We Do!